We always look forward to our visit with New Orleans family at Thanksgiving time, and we always enjoy our time there. Almost always. Maybe not so much this time. But we'll get to that. We arrived in Metairie at our usual 2am on Thanksgiving morning, after the long after-work drive from central Arkansas. Hayduke and I got up early on Thursday for beignets and a trip to the dog park while Bryan and Mandy slept in, and then Hayduke went down the street to stay at Kevin's house while the family enjoyed Thanksgiving dinner. It's such a treat to spend the day with family. Emma's grown so much since last year. She and her daddy were sick earlier in the week, but they're feeling better now. 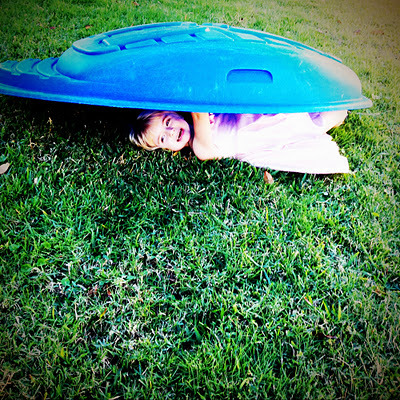 We took turns playing hide-and-seek in the backyard with her. Her favorite hiding place is under the lid for her tugboat sandbox. After lunch, she and I took forks and spoons and pretended to taste all the different plants and flowers in the backyard. We napped in the afternoon while Sharon went to visit Aunt Lynn's. That night, Bryan's dad got sick. Was it something he ate, or nerves? Was it the flu that Kevin and Emma had earlier in the week? We felt bad for him, and thought we'd get out of the house on Friday to give him some quiet time. We walked along the river and around the Quarter, visited Jackson Square, and ate lunch at an old beignet stand with a cat that wandered in and out of the dining room. 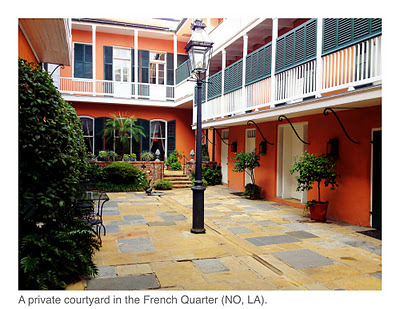 We took a tour of an old house there with beautiful courtyards. I enjoyed learning about the family who'd lived there - the wealthy woman didn't like to waste money, so when she found an object she liked, she'd just make it into something useful. Japanese clothes irons became ashtrays. Interesting pottery became lamps. A pine mirror that didn't match the cypress mantle wasn't re-worked in cypress, because that would've been wasteful; it was just painted to match. Not quite perfect? Oh, well. 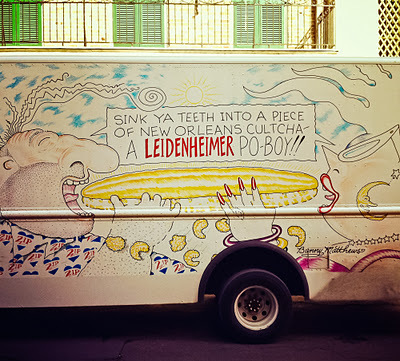 Oh, and we took a photo of a Leidenheimer truck. I love Vic and Nat'ly drawings. They're just so silly. We walked through the French Market and watched a man riding a super-tall unicycle in Jackson Square before heading back to the car. And that's the end of the story of our visit to New Orleans, because we spent the rest of our time being miserably sick. On Friday night, we stayed with Emma while her parents went out for sushi, and she and Mandy and I made our usual bookstore trip. Bryan got sick just before we left Kevin's house, and by Saturday morning, Mandy was sick too. It began to rain and they were stuck in the spare bedroom, with their buckets and fevers and misery. I tried to balance caring for them with taking care of Hayduke, who was cold outside but not really allowed in the house, since he's so rambunctious. We went to the dog park in the rain. We snuck into the bedroom to lie down. It was terrible. And it got worse. Michael called to say that he had been up all night throwing up. And then we heard from cousin Claire, who'd arrived back home in Oklahoma just to go straight to bed, miserably sick. When I threw up I crawled into bed next to Mandy. Our fevers matched - 102.4. Bryan's mom, who was amazingly not sick, wisely called his brother to come get Hayduke. The puppy played in Kevin's backyard with his dog, so that we could all rest. When we had to jump up to run to the bathroom, we couldn't use the one nearby, because it's Aunt Dot's bathroom and we didn't want her to get sick - we'd run with our bucket all the way across the house to the bathroom off the big kitchen. If I was awake, I'd follow to wipe all the counters with a Lysol wipe. If I didn't do it, Bryan's mom would. Oooooooh, it was awful. I was becoming friends with the people at the dog park, who were all very sympathetic. Sick family, energetic puppy, rain. Total strangers offered me hats and dog-sitting. And then it was Sunday, the day to go home. But we couldn't go home - the route from New Orleans to Little Rock doesn't have bathrooms at 15-minute intervals. We were better, but not THAT much better.We decided to stay another day, and I met my friend Cristina for a nighttime walk around the French Quarter. We visited some voodoo shops and sat at the old Cafe Du Monde and smelled the garbage and talked for a couple of hours. 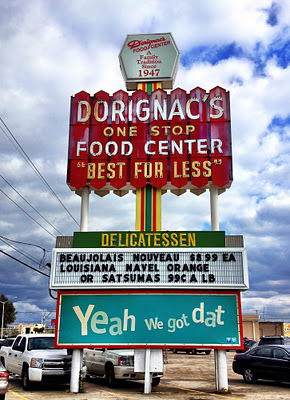 On Monday, we went to Dorignac's for our yearly andouille-and-beer run, and then we loaded up the car and headed home. Maybe next year will be better. We hope next year will be better. Next year had better be better.